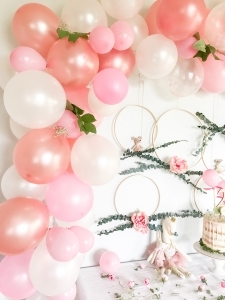 As I promised in my last post, I’m soo excited to share this DIY balloon garland with you today! 🙂 It’s SO much easier (and cheaper) than it looks and adds such a visual wow factor. Anddd, it’s perfect for ANY occasion. 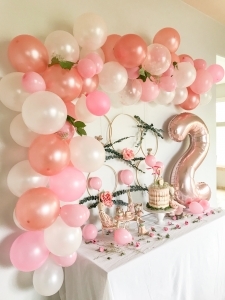 The possibilities are endless because you can mix and match so many different colors of balloons, shapes, sizes, themes, etc! 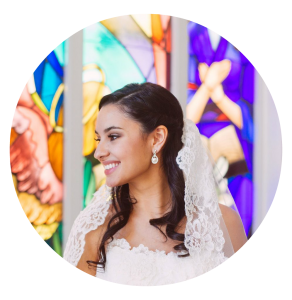 Got a bridal shower coming up? You could do gold, rose gold, creams, champagne. Valentine’s Day?! 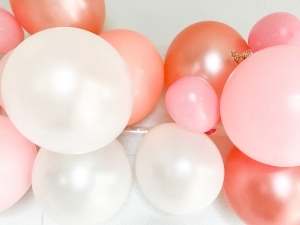 Heart shaped balloons, pinks, reds. DONE. Boy birthday party? Shades of blues, reds, greens. Girly unicorn party? Pinks, peaches, sparkles, gold mylar stars. Easy peasy. 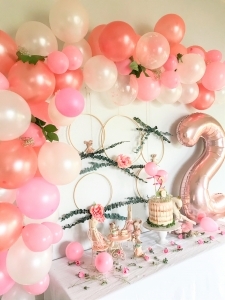 Endless ways to create your own balloon arch. I’m actually so excited to make one for basically every party/celebration we have in the future. It might even get obnoxious, ha. 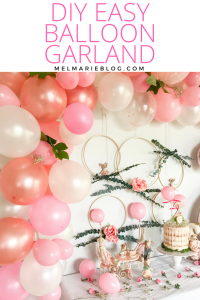 I searched HIGH AND LOW for the easiest, most straightforward and simple balloon garland, so I’m super happy to show you how to make one that requires minimal time and effort. Some of them look pretty intimidating, but I promise you, this one is insanely easy! I’ll show you EXACTLY what I used and how i did it! 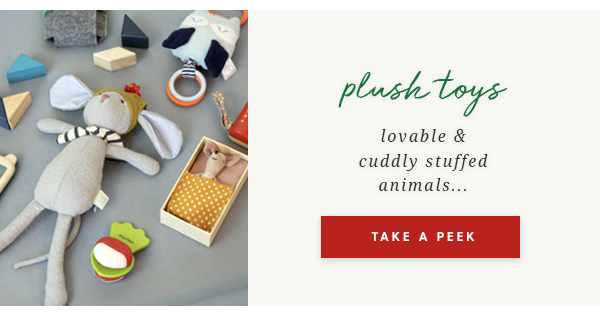 You could even make it the week or weekend before your party! 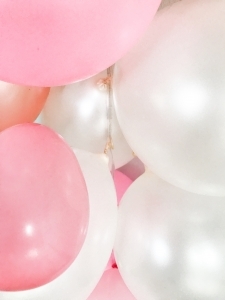 Since the balloons are not inflated with helium, you don’t have to worry about them loosing their helium within a few hours. I made this a couple days before Charlotte’s birthday, and here we are two weeks later, and it’s still good as new. I’ll be keeping it up for K’s party next weekend too! We have 4 birthdays in May/June, so this baby will be staying up for a good month or so. It’s just so pretty, right!? Okay, enough of my rambling.. let’s do this thang!! -Greenery or flowers if you’d like! *For the supplies I listed above, these are exactly what I used. You could totally use a different way for hanging, hot glue gun instead of glue dots, etc. This is just what I used and what worked for me! 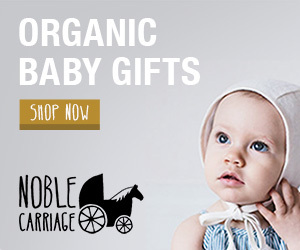 Feel free to modify it to suit your needs best. 1. 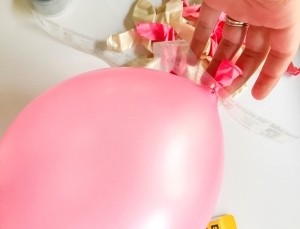 Cut your balloon strip to size. 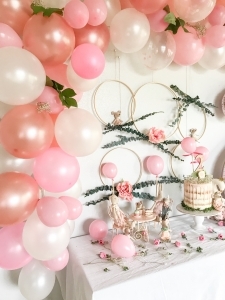 Figure out where and how long you want to hang your balloon garland. If you are hanging it outdoors, you could attach a piece of string to each end and tie to a tree or post or something outside. If you are hanging indoors, you could use command strips or thumb tacks to easily hang! Measure it out and cut the size you need. 2. Use your balloon pump to blow up your balloons and tie the bottom closed. Don’t fill them up to be completely full! They are more likely to pop that way. I filled mine about 3/4 and I didn’t have a single balloon pop on me. 3. 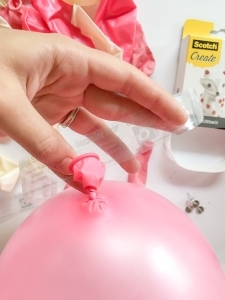 Next, slip the knot of the larger 12″ balloons into one of the holes in the balloon strip. Skip a few holes and place another balloon into the strip. This is where you can get creative and do alternating colors, patterns, etc. 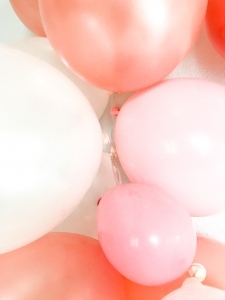 Keep placing balloons every few holes until you have filled the length of your strip. 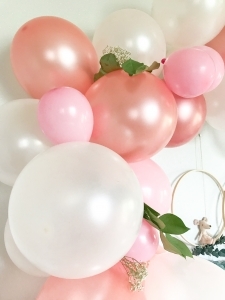 *It’s important that you do NOT pack the balloons in too tight when you are putting them into the holes, because then you won’t have space to add in smaller balloons later on. If it looks a little sparse, don’t worry! 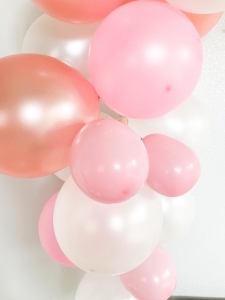 You’ll fill in all the gaps with the smaller balloons. 4. 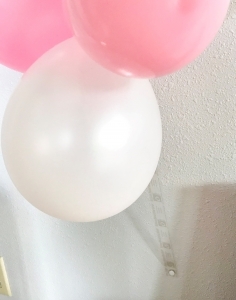 Once you have your main 12″ balloons attached to the strip, use your glue dots to attach the mini balloons into any spaces or crevices that aren’t filled in. 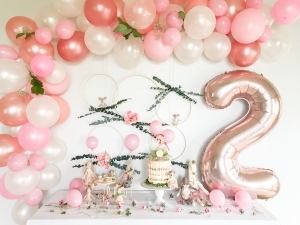 I also used glue dots to attach more of the 12″ balloons to any sparse looking spaces. Keep doing this until your arch is completely filled in, and you are happy with it! In the photo below, you can see how there is a gap where you can see the strip showing through. This is where you’d add additional balloons with the glue dots to fill the spaces. I used two glue dots per balloon, just so it’s more secure. 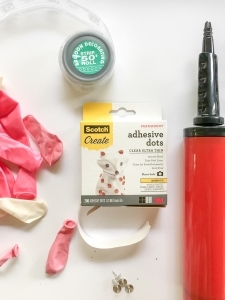 I’ve heard of people using a hot glue gun, but I didn’t want to do this in case it would cause the balloons to pop, and it’s way easier to use glue dots and not have to plug in a glue gun! In these pictures, you can see how the strip is showing when you look close up. 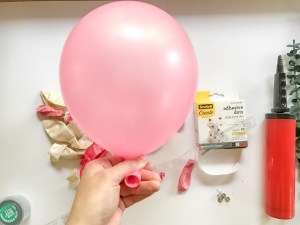 You can twist and rearrange your balloons to cover the strip and keep it from showing, as well as use those glue dots to add more balloons! A lot of this is just rearranging and moving balloons around till you’re happy with it. I attached my garland to the wall by using small white thumb tacks (shown below). I didn’t have any small command strips on hand, and this worked great. 5. When you have added all your extra balloons with the glue dots, you shouldn’t be able to see any of the strip peeking through! You can make it as full as you want, depending on your personal preference. 6. 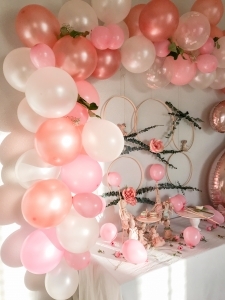 If you want to add little sprigs of greenery or flowers to your arch, you can just tuck them into the balloons once you already have it up and set up how you want it! This is the last step. I had a hard time getting the greens to stay, and if I had been more patient I would’ve taped them in so they wouldn’t fall out. But alas, I was too impatient to go back through and tape them, lol. And there you have it! 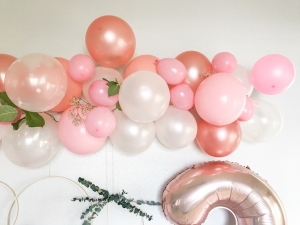 An easy, beautiful decoration idea for your next celebration. Let me know if you make one of your own! I’d LOVE to see what you do!! Love this decoration idea!! I never even thought to make them in varying sizes in order to create a highly affordable room decor. 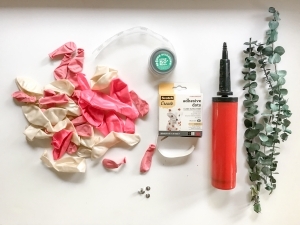 I’m just about to post a post on making mini pinata’s as well that I think you might find it cute to add to the party! This is beautiful! I always assumed I’d have to buy one already done, but now I know I can DIY it! Thanks for the instructions! Love this! I’d like to make it for my daughter’s baby shower. My question: where did you get the rose gold and confetti balloons? Approximately how much ballon do you used ?